Australia's most exclusive Yacht Club with a membership of just ONE ! Life-jacket and tie for gentlemen and inflatable bikinis for ladies. Few have heard of the incredible voyage of this intrepid German, who spent seven years and four months paddling a collapsible kayak from his native town of Altona in Hamburg all the way to Thursday Island in the Torres Strait. Oskar Speck was born in 1907, one of five siblings. Just after graduation, he started working as an electrical contractor in a factory that closed in 1932 during the Great Depression. With no prospect of work, the keen canoeist and outdoor enthusiast saw this as an opportunity to take his collapsible kayak Sunnschien (sunshine) and venture to Cyprus to try his luck in the copper mines. 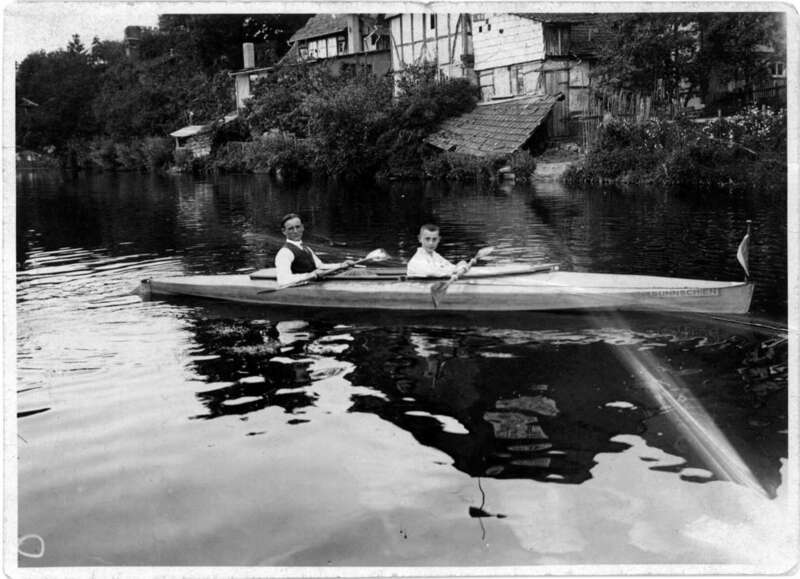 Sunnschien was a double kayak produced by the German manufacturer Pionier Faltboots (which would become his biggest sponsor) which Speck modified for single use, leaving room for storage of equipment, clothing and provisions. The flexible wooden frame allowed it to be folded into a small bundle for carriage and storage. With a small sum of money collected by the sale of his belongings and contributions from his family, Speck set off from Hamburg on 13 May 1932, when Hitler was almost unknown. Armed with a kayak, two paddles, a camera, film, clothing, a pistol, documents, sailing charts and a prismatic compass, he paddled down the Danube through central Europe towards the Mediterranean. During his voyage he kept in touch with family and friends by letters. Through them he learnt about the changes of the political panorama in both Germany and the rest of Europe. He kept the letters with the hope of one day writing a book about his voyage. Once in Cyprus, he quickly realised that this nautical adventure was more enticing than working in the mines, so he decided to continue to Syria and then to challenge himself by paddling down almost the whole length of the Euphrates. ‘I wanted much more to make a kayak voyage that would go down in history’ (The Australian Post, 1956). While waiting for a replacement kayak after his broke in the Persian Gulf, he contracted malaria, a disease that would accompany him for the rest of his voyage. Pionier replaced Oskar’s kayak four times in total, and in return, used Oskar’s adventures and photographs to promote their products. He then continued to India and paddled his way along the coast. It was 1935 and Oskar was already a well-known figure in Germany, as many magazines and newspapers were reporting on his voyage. Capitalising on this and his good English he gave talks and presentations to mostly English expats who were more than happy to donate to the cause and recommend him to other connections living in Asia. During 1936 Speck paddled his way along the Bay of Bengal, Malacca Strait and the Dutch East Indies. While in Singapore, he collected another kayak and paddled on to Indonesia. During this time, he was pressing friends and papers to get more coverage of his story but the political turmoil in Europe and the Olympic Games were getting all the attention. 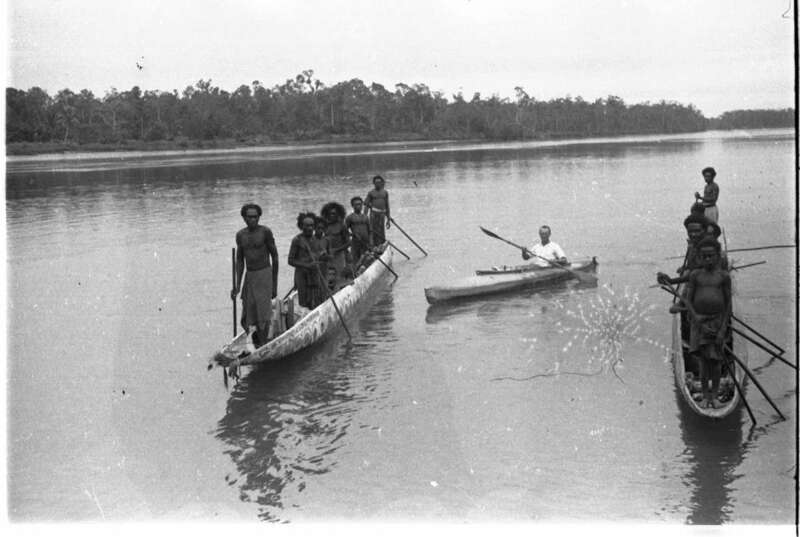 Malaria and the monsoon slowed Oskar’s progress and he only managed to get to the coast of Dutch New Guinea in 1938. Here, the authorities were unsure if the German visitor should be arrested or permitted to continue his trip. After more delays, he finally continued towards Australia. On his arrival to Daru Island, the officer in charge decided not to arrest Oskar but instead let him complete his dream and reach Australia. But it was his luck that in September 1939 two constables were waiting for him at Thursday Island. After congratulating him for his feat, the officers told him that he was now classified as an ‘enemy’ and had to be arrested and transferred to an internment camp. After a month in Thursday Island, he was transferred to Brisbane and then Tattura Interment in Victoria. He escaped the camp but was quickly recaptured and sent to South Australia until his release at the end of the war. Oskar had kept all the letters and newspapers clippings in preparation for the talks and conferences he was to give and the book he was going to write. ‘So ended one of the most fantastic and dangerous voyages ever accomplished by an individual … I have reached my goal, but not one of the numerous doubters would ever find out and my modest success in reaching Australia in my folding boat would be swallowed up in the imminent global catastrophe’. Sadly for Oskar, by the time he was ready to tell his story and show the world images of his amazing voyage, the world had moved on, so he never got to be the hero he dreamed of being. P.S. Did you know that Western Australian kayaker Sandy Robson re-enacted Speck’s journey? Follow the journey on her website.